This disadvantage varies in significance by application. Sometimes, roughness may not matter at all, and can even be a good thing in certain situations. Most components, however, will eventually end up as part of an integrated system that requires a certain level of smoothness. Metal 3D printing, regardless of material, has struggled to produce smooth finishes. Reducing friction is critical in mechanical parts like pistons, bearings, and seal surfaces where too much contact between moving surfaces can lead to rapid wear-and-tear. The rougher the surfaces in an integrated, dynamic machine, the less quietly, efficiently, and safely they’ll operate. The specifications will differ case by case, but the smoothness required of an end-use part can be an important factor to weigh in costing it. Surface Finishes of 3D Printed Metal Parts vs. Conventional Mfg. It’s important to quantify the trade-offs associated with 3D printing a component instead of using CNC machining, casting, or metal injection molding. While many variables influence the final Ra (roughness average) of a part, metal 3D printing produces parts with greater surface roughness than do these methods. Metal injection molding typically delivers the smoothest finishes (with a typical Ra of 30-50), while casting is relatively rough (ranging between a 100 and 500-micrometer Ra). Metal AM, on the other hand, has very rough surface finish - typically in the 250 - 400+ Ra. Part of the challenge, of course, is that there are so many types of metal AM processes, and each has its own roughness. The specific type of printer used, part complexity, and materials used can all play a major role in the final roughness of a component. The range of technologies has resulted in a range of surface finishes between 200 and 1000 Ra, making it harder for manufacturers to pin down the exact smoothness they should expect. The bottom line is the closer to the final required finish before post-processing, the lower the finishing operation will cost. If a part is 800 Ra and needs to be < 50 Ra, a lot of work needs to be done to get there. Before settling on a production technique for a given component, manufacturers should factor their surface finish requirements into the overall cost equation. No matter what production process is used, parts must meet design specifications that often include measures of surface finish. If the end-use application of a component calls for a roughness average of under 200 micrometers and the part exits the build chamber with a Ra of 500 micrometers, that’s a problem that will take time and money to rectify. Nearly all 3D printed components require some form of secondary finishing, which adds time and cost to the manufacturing process. There are a number of common post-processing techniques that can bring a 3D printed part to the necessary smoothness. Disc finishing, high-energy centrifuge, and stream finishing have all been applied with success in reducing the roughness associated with metal AM. These processes, however, aren’t always controlled in-house. Anytime a manufacturer has to outsource post-processing, frictional costs are incurred: shipping and administrative expenses come into play on top of the actual costs of having the finishing done. There’s also an increased risk of quality issues creeping in when multiple parties are involved. At the extreme, post-processing costs can erode the advantages 3D printing brings in the first place by adding steps (and time) to the manufacturing process. In order to continue to widen the addressable range of manufacturing needs metal AM can meet, it’s imperative that surface finish in metal AM improve dramatically. That's why 3DEO has made significant investments to achieve what is commonly called "the best surface finish in metal 3D printing." Our patent-pending Intelligent Layering process maintains the value of the 3D printing process by consistently achieving finishes as smooth as 100 Ra. 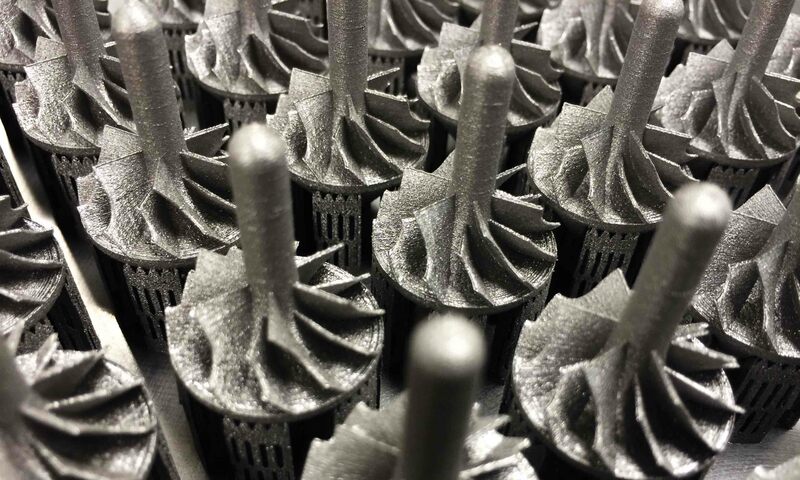 In addition to the as-printed surface finish, 3DEO's parts have been polished to < 10 Ra. Surfaces this smooth improve end-use functionality and eliminate the need for secondary treatment in many applications—not to mention their aesthetic value. This level of finish is on par with the smoothest casted surfaces and is substantially better than what’s currently possible elsewhere in the metal AM industry. If your design specifications call for still smoother finishes, 3DEO also offers a number of post-processing options that we control in-house that can get below 10 Ra. We’re thus able to control the entire production process from start to finish and tightly manage both costs and quality. You can find more on the technical specifications associated with our proprietary technology here.